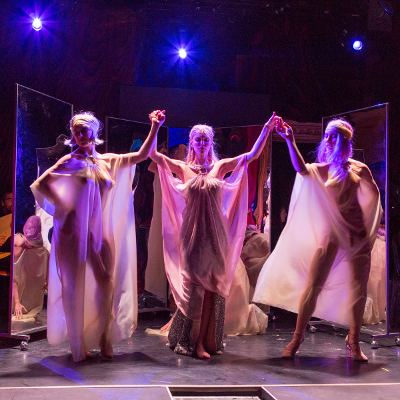 I went to see Francesco Cavalli’s Eliogabalo as produced by the Gotham Chamber Opera at The Box and I wrote about it for Bachtrack. 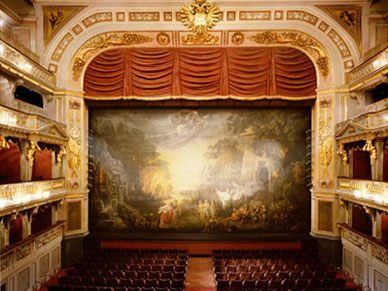 aesthetic of 17th-century Venetian opera. You can read the whole thing here. (In my discussion of the intersection of seventeenth-century orchestration and burlesque, I introduced the Bachtrack editorial staff to the phrase “bump it with a trumpet.”) This production didn’t work because it was one-note while seventeenth-century Venetian operas are heterogeneous. Venetian opera is closely associated with Carnival (in that respect the timing of this production was really bad–sorry, you go through one Viennese Holy Week of Faust, Parsifal, and Dialogues of the Carmelites and the idea sticks with you forever). But Eliogabalo is something far more interesting than a celebration of excess. I thought of Calixto Bieito’s fantastic production of Platée, which I saw last summer at the Staatsoper Stuttgart (and didn’t blog about, sorry). It’s set in a nightclub, though not in the environmental theater sense of The Box. The Studio 54-like club (a good modernization of the ancien régime) provides an ostensible freedom for an outsider like Platée. But the hierarchy of court life is always lurking just beneath the surface, and the outsiders never escape their eventual punishment. Eliogabalo never leveraged its similar setting with this kind of dramatic intent. The singing was fine but most of it was not very stylish. New York doesn’t attract enough people with extensive experience with this music. (The Wooster Group’s utterly bonkers sci-fi La Didone mashup was better sung, actually, and far more compelling.) The US’s cavernous opera houses and conservative programs confine all but the most famous Baroque operas to boutique outfits like Gotham, but unfortunately based on this production they lack the expertise to present these works to their best advantage. Gotham is, usually, a very strong company, and I hope they’ll try another early Venetian opera soon with better results. 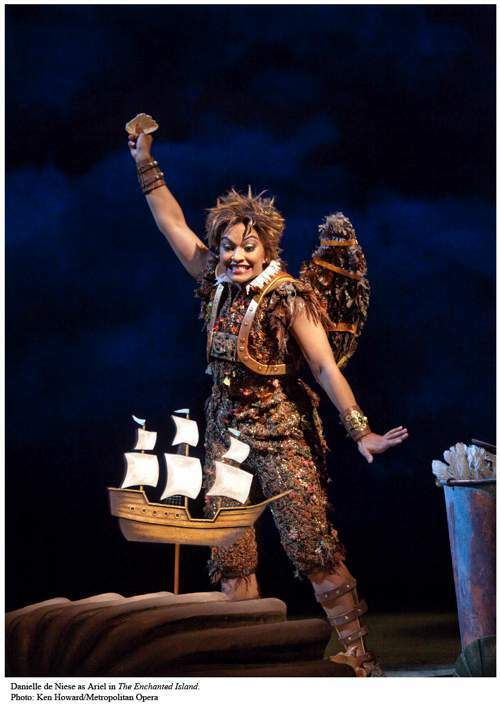 Contrary to anything you may have read, the Met’s The Enchanted Island pasticcio does not feature a cameo by a wisecracking René Pape as the Skipper. * But it’s got just about everything else. Everything, that is, except a reason for us to care. 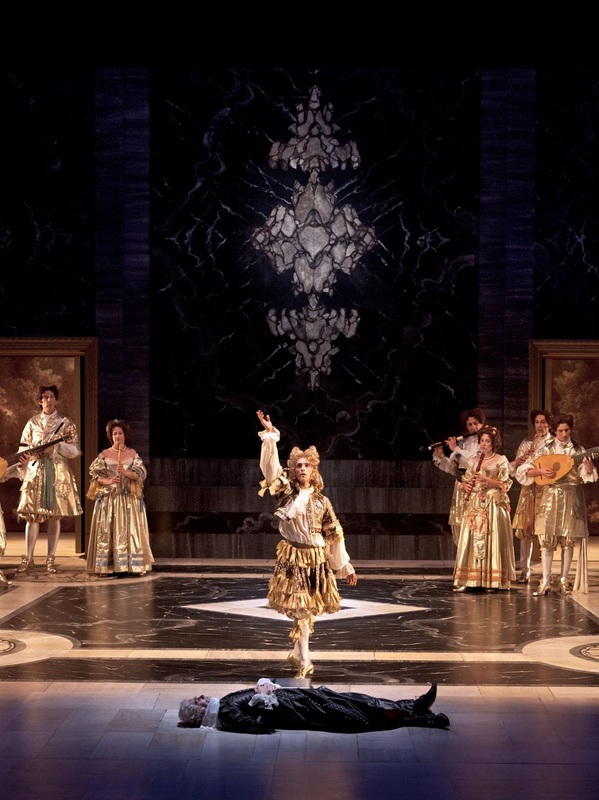 An all-star cast belts out top Baroque tunes in a beautifully designed production, but thanks to Jeremy Sams’s insipid, self-indulgent libretto, most of it ends up being much ado about nothing. Why can’t we have actual Baroque opera instead? Various, The Enchanted Island. 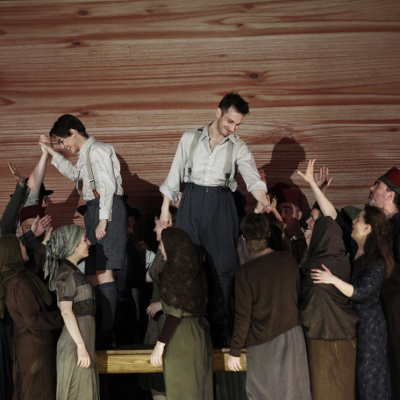 World premiere pasticcio, Met Opera, 12/31/2011. Assembled by Jeremy Sams, conducted by William Christie, directed by Phelim McDermott and Julian Crouch, sets by Crouch, costumes by Kevin Pollard, lights by Brian MacDevitt. 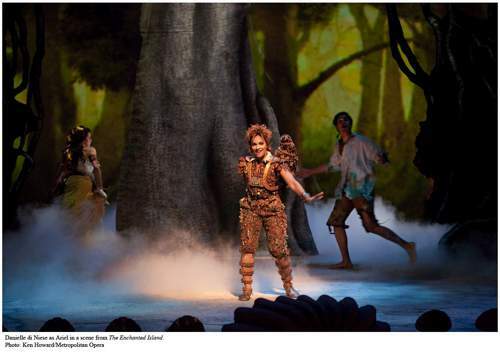 With David Daniels (Prospero), Joyce DiDonato (Sycorax), Danielle De Niese (Ariel), Lisette Oropesa (Miranda), Luca Pisaroni (Caliban), Placido Domingo (Neptune), Layla Claire (Helena), Elizabeth DeShong (Hermia), Paul Appleby (Demetrius), Elliot Madore (Lysander), Anthony Roth Costanzo (Ferdinand). The Enchanted Island has hitched itself to the eighteenth century pasticcio tradition, a conglomeration of old music set to a new story. But it’s a 21st-century creation through and through, as I think its creators would readily acknowledge. ** Jeremy Sams is responsible for the libretto. In a rewrite of The Tempest, Prospero is situated on the titular island (which makes whooshing noises identical to the one on Lost) and must confront the challenges of age, Ariel, and his lady-rival Sycorax (who is already dead in the Shakespeare). But rather than the intended Ferdinand, the honeymooning four lovers from A Midsummer Night’s Dream wash up instead. While Prospero’s responsibilities to the island and Ariel seem to be the central plot problem, most of the work’s time is spent with these four, who along with Miranda and Caliban go about doing what Shakespearean lovers do best: fall in love with the wrong people. The music selection (here is a list) has some nice pieces and the sung texts are relatively smooth, but the shifts between the eight different composers selected can be rocky. Handel dominates, but the bits of French stuff harmonize poorly, and some of the Vivaldi sticks out as well. Many da capo arias’ B and A’ sections have been lost at sea, and some (presumably newly-composed) recit is pretty stylistically wonky (and I’m not sure where all the chamber-scored bits and accompagnato came from). More severe is the feeling that much of the music was chosen largely at random and shoehorned into the plot just as forcibly as the Midsummer lovers were. Some transpositions of duets and arias up and down octaves are quite peculiar (most strangely Vivaldi’s coloraturific “Dopo un’orrida procella” given to a baritone Lysander and “Arise ye subterranean winds” given to a soprano Ariel), and the expression doesn’t always line up either. Baroque music often was retexted back in the day, but that doesn’t mean that any sentiment goes. Old story, old music–it’s less a story than a simulacrum of a story, the pale imitation of something we’ve all seen done before, and better. It unfolds bumpily and shapelessly, aided by the magical character’s spells in the service of a librettist who seems to think himself exceptionally clever. Yet there’s little genuine wit on display, and even less adult emotion, and sincerity, nor a clear emotional trajectory. These are all things you can find Baroque opera, but in the pastiche-ing they’ve been misplaced. This was all the more dispiriting because the production is simply gorgeous, with lush costumes and projection scenery on a screen behind an elaborate second proscenium. (There are many more photos at the bottom of this post.) The visual style is original and whimsical and poetic and unfortunately rarely tries to upstage the action. Only a few Disney-ish moments of sparkle seem cheesy. 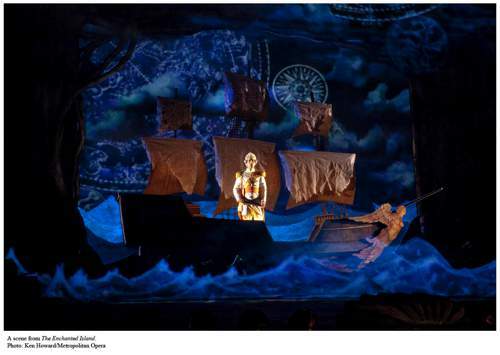 The other effects are lovely, though I wish the rest of the audience hadn’t started applauding over the music when the ship sank. But the island is disenchanted. We’re told that the superficiality proudly espoused by this work constitutes “fun.” We don’t have to wonder why Prospero is obsessed with making everyone move piles of wood because they’ve left that weird bit out! But, three-quarters of the way through Act 1 I found myself, probably aided by a certain degree of sleep deprivation, in the throes of an existential crisis that had been building up all season. If Enchanted Island was a failure, an attempt at a fun romp that ended up sort of tangled, then too bad, maybe the next one will work. But what if it was, on its terms, a success? What if this is our fun now? What if now all we desire of opera is this exquisitely crafted nothing, smug and regressed to childhood and utterly irrelevant to anything that makes us human? Why are we creating “art” that in many ways isn’t art at all? Maybe I should pack it in and start going to the movies more. Then I wouldn’t be asking all these damn rhetorical questions. Two things happened that while not up to salvaging the evening at least made me stop contemplating das Ende. 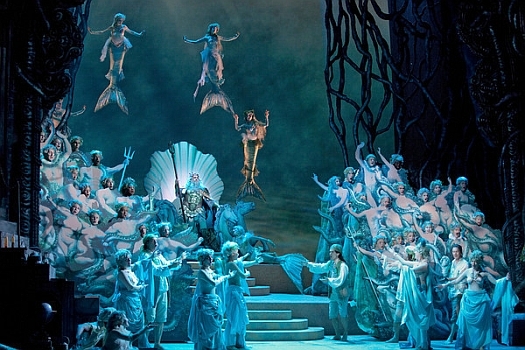 The first was the biggest coup de theatre of the production, the entrance of Placido Domingo as Neptune. He arrives on a seashell flanked by ranks of mermaids to the strains of “Zadok the priest,” robed and wearing a gigantic beard. It’s an image of sufficient outrageousness and novelty as to overpower the fact that his subsequent scene does not advance the plot and our tenor appeared to have not looked at his music ahead of time, kept getting behind Christie, and didn’t know the words (compounded by the juxtaposition of Handel, Rameau, and Vivaldi in close quarters, one of the evening’s least felicitous moments of pastichery). The staging had finally upstaged the far inferior text with sheer audacity. 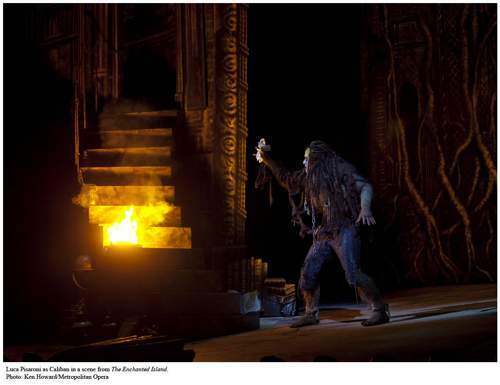 The second moment was in the second act and can be described as Caliban’s coming of age, when Helena leaves him for her recovered Demetrius. With his mother Sycorax’s revival, Caliban’s status in the plot is kind of unclear. Also he’s a monster in KISS tribute makeup. But the sting of his rejection is the most comprehensible emotion we’ve seen yet and Luca Pisaroni played him with such sweetness and honesty that I found myself, for the first time, in a real story. 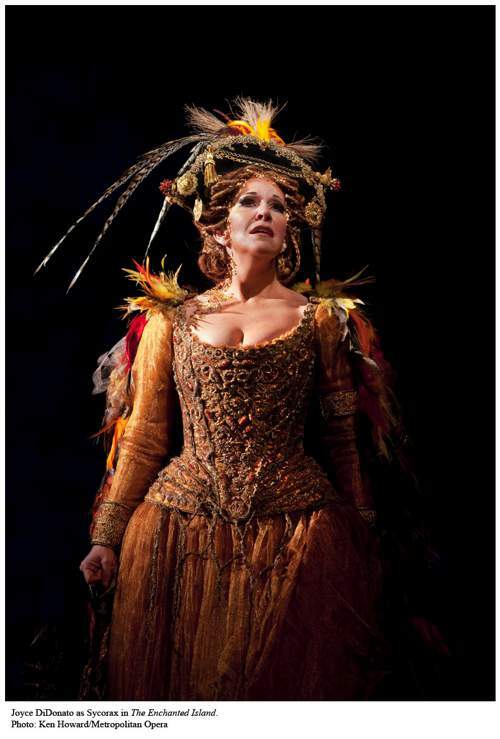 Joyce DiDonato’s Sycorax, to this point a scenery-chewing caricature, turns human and three-dimensional. The following masque-style dream sequence, set to French music, has a plot that seems to be misplaced from the Great Courtesans of History ballet excised from November’s Faust and features some strangely aerobic choreography from Graciela Daniele, but the change of pace is welcome–more dance would have been great. Unfortunately Caliban is more or less dropped as a character after this. Such is one’s fate in a work whose cast is the operatic equivalent of Love, Actually so prepare for a list discussing the singers. We’ve already covered Placido, and Pisaroni, who sings as well and expressively as he acts, and DiDonato, whose coloratura is great and stage presence significant but whose singing has this kind of constant tension that keeps her sound edgy and tightly wound, including in some places where that isn’t ideal. Danielle De Niese managed to make the very annoying Ariel not that irritating, though he (Ariel) bears the brunt of the plot mechanics. 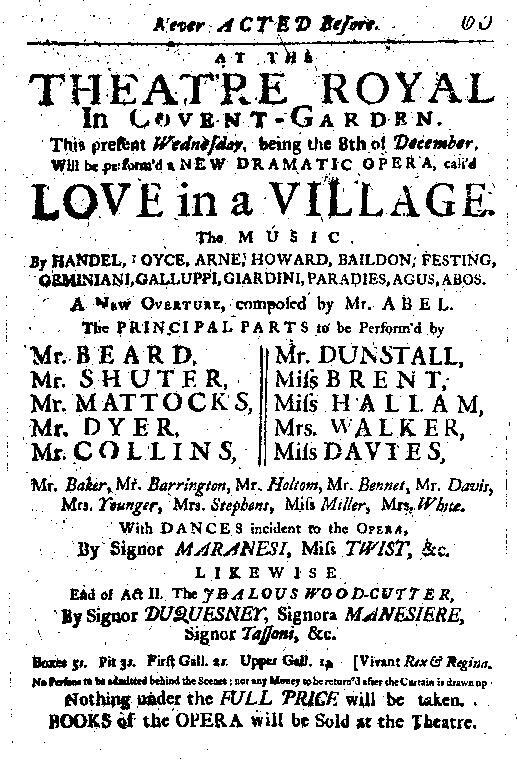 She (De Niese) engaged in some approximatura at inadvisably fast tempos in Act 1 but carried off the popular Vivaldi showpiece “Agitata da due venti” surprisingly well–though, it must be said, the aria is cut down to only its first section. The most beautiful tones of the evening were from the lyric sopranos Lisette Oropesa as Miranda and Layla Claire as Helena, both of whom I hope I will be hearing lots more of in roles where they can develop characters. 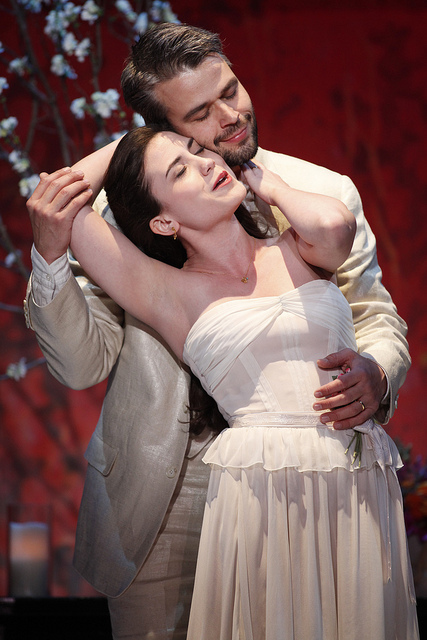 Mezzo Elizabeth DeShong was great in “Where shall I fly” from Hercules, I mean here she was Hermia. 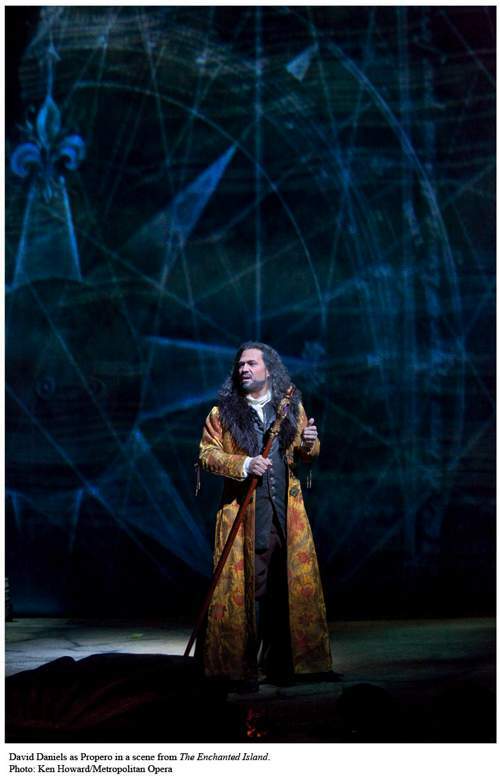 David Daniels was in the nominally central role of Prospero but did not make a strong impression and sounded thin and effortful, though his singing is musical. Stronger was the powerful countertenor of Anthony Roth Costanzo in the Fortinbras-like role of Ferdinand, who made the most of his one aria and duet. As Demetrius and Lysander, Paul Appleby and Elliot Madore were fine but made less of an impression than the women. William Christie must, for better or worse, must bear much responsibility for this affair as well. As for his conducting, it was good. It was, as one would expect, very fast. This had a much less percussive and crisp effect with the Met’s modern orchestra than it would have with a historical practice one, and sometimes the singers were challenged. Still, he knows the style and got the orchestra sounding more Baroque than I would have expected. The instrumentation was small but not so small as to sound dinky. But the entire thing left a bitter taste, a dumbed- and watered-down evening that is for the most part not actually that fun. I suspect this was a one-off experiment, and it’s not one I would be eager to repeat. 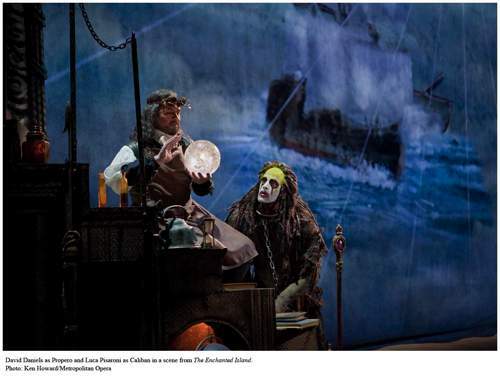 Can we give a real Baroque opera a shot next time, please? **See also Text and Smacked, I mean, Text and Act. from Semele is set as a quartet [?]) to relatively obscure items. 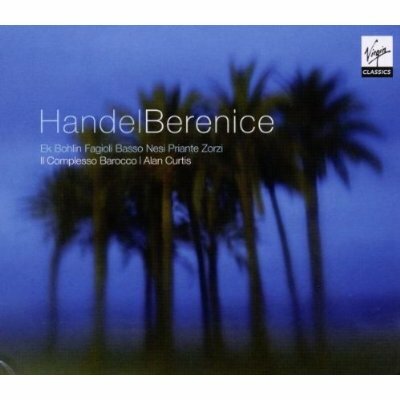 Handel dominates, and the French music provides most of the dances. 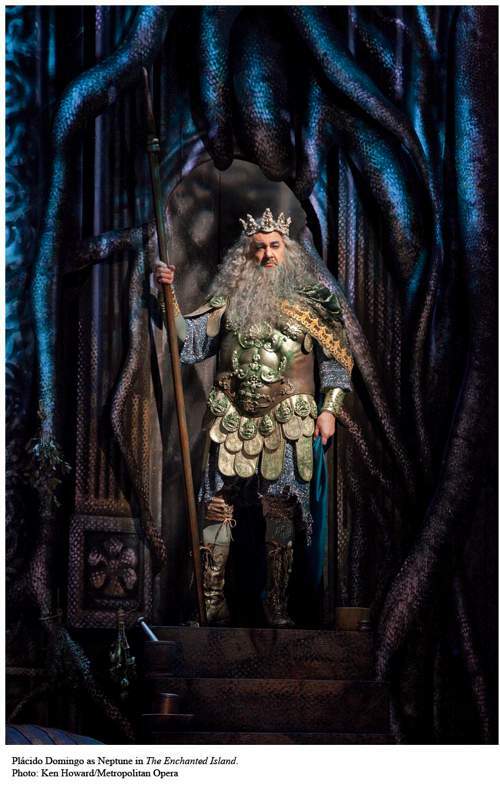 Placido Domingo will arrive as Neptune to the strains of “Zadok the priest,” best known to British people for its use in coronations and as the “Champion’s League” theme song. In case you were wondering, the plot will combine The Tempest and A Midsummer Night’s Dream. You can read a synopsis here (PDF). It sounds a little complicated? I should be writing about Dark Sisters right now but to quote Rick Perry I stepped in it on Twitter this morning regarding the prospects for the Met’s new Baroque pasticcio, The Enchanted Island, and I wanted to explain a bit more without the constraint of 140-character installments. While I tend to be pessimistic, condemning a piece before it even premieres is rather mean-spirited and I should probably avoid doing it. But I can’t shake the feeling that this won’t be doing Baroque opera (a field in which I have had, sigh, some degree of involvement) any favors and here’s why. Pick out about an hundred Italian Airs from several Authors, good, or bad, it signifies nothing. Among these, make use of fifty five, or fifty six, of such as please your Fancy best, and Marshall ’em in the manner you think most convenient. When this is done, you must employ a Poet to write some English Words, the Airs of which are to be adapted to the Italian Musick. In the next place you must agree with some Composer to provide the Recitative … When this is done, you must make a Bargain with some Mungril Italian Poet to Translate the Part of the English that is to be Perform’d in Italian; and then deliver it into the Hands of some Amanuensis, that understands Musick better than your self, to Transcribe the Score, and the Parts. The pasticcio became a way for in-demand composers to become more prolific, cranking out new works from old music. Handel did this a great deal. But the larger question is of the Met’s duty to Baroque repertory. I’m not sure if it should have one at all; the theater is just too big to go about it properly and the lack of a period instrument band in the pit is a major problem. But if they are going to do it they should try to do the genre justice. Of Baroque composers, in the modern era the Met has produced only Handel. 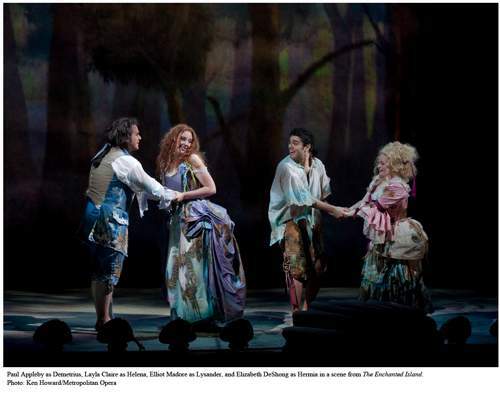 But Enchanted Island seems more a way of producing something with a star cast and spectacle than it is to introduce new music to the Met audience. Why go to the lengths and risk to create a new work when there are many, many wonderful Baroque operas that the Met has never produced? For all the house’s size, one of the really grand French Baroque works by Lully or Rameau could maybe work. I didn’t mean to develop this so far before Enchanted Island even happens–for all I know it will be an ahistoric blast and will justify its existence in practice by being totally fun. But I’m still not happy with it in theory.